From an early age, Patrick studied electronic music and digital synthesis, which led him, at age 15, to his first career move as a Musician/Audio Engineer at Westwood Studios. Not only did he compose original music, create instruments and sound effects and arrange existing songs, but he also worked as a voice-over actor on titles such as The Kyrandia Series (I, II, III), Lands of Lore and The Lion King. Impressed with his work on The Lion King, at age 18, The Walt Disney Company offered Patrick the position of Senior Sound Designer for interactive titles. At Disney, Patrick composed original music and arranged existing Disney songs for multitudes of titles including Nightmare Ned, 101 Dalmatians, Gargoyles, and Pocahontas. During this time, Patrick was a panel judge on the board of the Academy of Interactive Arts & Sciences reviewing the top interactive properties' music production. 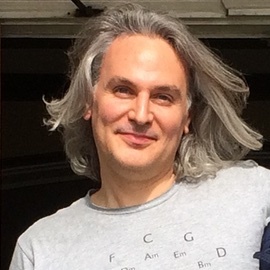 Outside of his work at Disney, not only did Patrick fervently continue his piano and voice classical training, but he also freelanced as a singer/songwriter/composer and, in a joint venture with Ronny Moorings (from the band Clan of Xymox), he composed original music for Revenant, one of Eidos Interactive's top titles. In the summer of 1998, Patrick accepted the opportunity to tour Austria, Poland, and the Czech Republic singing in performances of Dvorak's St. Ludmilla. This sparked Patrick's yearning to continue his formal music education, and in the fall of 1998, Patrick began studying at California Institute of the Arts (Cal-Arts) where he focused on classical piano repertoire, vocal studies, music theory, and musicianship skills. Outside of school, Patrick continued to work freelance as a sound designer and composer for several high-profile companies such as Paramount and Jim Henson Studios. In 2007, his first CD was released and it is currently available on iTunes. Patrick currently enjoys spending his time working on classical repertoire, cooking, doing yoga, and working with computers doing software engineering.